Flamenco Red with Doeskin interior. Fully restored and uprated some years ago this beautiful Mk11 has an excellent specification for fast road use or road rallying. The rebuilt 3.4 litre, six cylinder engine is rebuilt to Fast Road (enlarged inlet valves, a fully polished and ported cylinder head, mild cams) specification with unleaded cylinder heads, a Getrag five speed gearbox is fitted along with electronic ignition, fully rebuilt uprated suspension with Koni shock absorbers, uprated brakes with four pot callipers, Jaguar power steering, 6" wide chrome wire wheels and a Kenlowe fan. The interior has Jaguar XJ6 fully electric seats, electric front windows and mirrors, seat belts all round and a Pioneer CD Hi fi system fitted. 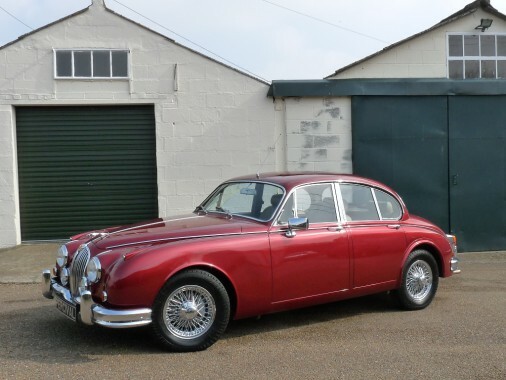 The last owner has spent in excess of twenty thousand pounds over the last four years having the car maintained properly with full engine, suspension and brake overhauls by Jaguar specialists. It look stunning in modern Flamenco red and is fast and comfortable.